når du er klar til dette. Alt du behøver, er så en simpel software opgradering. Uanset hvad dine behov er, giver DP1400 en enkel , pålidelig og omkostningseffektiv kommunikationsløsning. Simple and affordable, the DP1400 portable two-way analogue/digital radio connects your workforce efficiently—and has the flexibility to grow with your business. By combining the best of two-way radio functionality with the latest analogue and digital technology, the DP1400 is perfect for the everyday user who wants to stay connected. Fully compatible with the MOTOTRBO family of radios, the DP1400 has superior audio quality, outstanding coverage, long-lasting battery life and more.You can also choose the analogue-only DP1400 model, which gives you great voice communications today, with a path to crisp and clear digital voice communications when you’re ready. All you will need is a simple software upgrade. Whatever your needs, the DP1400 provides a simple, reliable, cost-effective communication solution to help work crews connect and coordinate. Benyt dig af verdens mest skalerbare digital radio løsning . DP2400 tilbyder en skalerbar løsning på krævende kommunikationsbehov. Intelligente audio- og tale funktioner letter kommunikationen i vanskelige arbejdsmiljøer . Radioen er analog interoperable, så du kan foretage overgangen fra analog til digital løbende, uden at skulle skifte hele dit analoge system fra starten. Fås i UHF og VHF frekvensbånd. DP2400 er en ikke- display model, der er udstyret med 16 -kanals kapacitet , tre programmerbare knapper og IP55 specifikationer for bl.a. beskyttelse mod vand . Equip your team with the world’s most scalable digital radio solution. The DP2400 offers best-in-class audio in a scalable solution to your demanding communication needs. Intelligent Audio and voice announcement features enable easy communication in difficult work environments. Also, it’s analogue interoperable, enabling you to make the transition to digital at your own pace, all at a value that stands up to the competition. Available in UHF and VHF frequency bands, the DP2400 is a non-display model that features 16-channel capacity, three programmable buttons and IP55 specifications for water protection. Benyt dig af verdens mest skalerbare digital radio løsning . DP2400 tilbyder en skalerbar løsning på krævende kommunikationsbehov. Intelligente audio- og tale funktioner letter kommunikationen i vanskelige arbejdsmiljøer . Radioen er analog interoperable, så du kan foretage overgangen fra analog til digital løbende, uden at skulle skifte hele dit analoge system fra starten. Fås i UHF og VHF frekvensbånd. DP2400 er en  2 linies display model, med begrænset tastatur for nem menuvalg. Er udstyret med 128 kanals kapacitet , tre programmerbare knapper og IP55 specifikationer for bl.a. beskyttelse mod vand . Equip your team with the world’s most scalable digital radio solution. The DP2600 offers best-in-class audio in a scalable solution to your demanding communication needs. Intelligent Audio and voice announcement features enable easy communication in difficult work environments. A crystal-clear black and white screen makes menu navigation and accessing contacts easy. It’s also analogue interoperable, enabling you to make the transition to digital at your own pace, all at a value that stands up to the competition. Available in UHF and VHF frequency bands, the DP2600 features a 2-line display and limited keypad for easy menu navigation with 128-channel capacity, three programmable buttons and IP55 specifications for water protection. radio i enhver krævende situation. 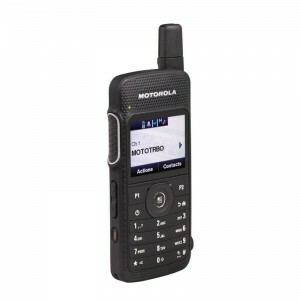 As part of Motorola’s MOTOTRBO™ family, the DP3441 offers the best in digital radio technology. Empowering your workers with integrated voice and data, the DP3441 allows them to share information wirelessly and instantly between devices. Integrated GPS enables location tracking of mobile work teams, helping improve personnel safety and operational efficiency. And this radio is not afraid of dust, dirt or water—it stands up to the harshest and most inhospitable conditions with exceptional durability. Wherever you’re on the move, the slim, powerful and reliable DP3441 can always be right by your side. Med MOTOTRBO ™ SL4000 serien er du i øjeblikkelig kontakt og kontrol. Så utroligt tynd og let, er SL4000 serien det ultimative i diskrete kommunikation. Alsidig og kraftfuld, er MOTOTRBO SL4000 serien bærbar radio designet til at opfylde kommunikationsbehov af brugere i de gæstfrihed , service , sikkerhed og lufthavnen industrier. Vejning så lidt som din gennemsnitlige smartphone , dens slanke design og fremsynede funktioner såsom Intelligent lyd, integreret Bluetooth og skjult tilstand , der kan forbedre din grad af professionalisme og diskretion , så du kan give bedre kundeservice og hurtigere svartider . From the concierge desk to the convention centre, MOTOTRBO™ SL4000 Series keeps you instantly connected and in control. So incredibly thin and light, the SL4000 Series is the ultimate in discreet communications. Versatile and powerful, the MOTOTRBO SL4000 Series portable radio is designed to meet the communication needs of users in the hospitality, services, security and airport industries. Weighing as little as your average smartphone, its slim design and forward-thinking features such as Intelligent Audio, integrated Bluetooth and covert mode, enhance your level of professionalism and discretion so you can provide superior customer service and faster response times. DP4400 / DP4401 -serien af bærbare radioer, giver uovertruffen tale- og datakommunikation, med valgfri integreret GPS, samt Bluetooth audio og data. Fås i UHF og VHF frekvensbånd. DP4400 / DP4401 er nem at bruge, og har op til 32 kanals kapacitet , fem programmerbare knapper , nødknap , IP57 specifikationer for  bl.a. vandtæthed. The DP4400 / DP4401 Series portable delivers unrivaled voice and data communications with optional integrated GPS plus Bluetooth audio and data plus best-in-class audio that includes Intelligent Audio and customizable voice announcement feature. Available in UHF and VHF frequency bands, the DP4400 / DP4401 is easy to use and features up to 32 channel capacity, five programmable buttons, emergency button, IP57 specifications for submersibility and FM intrinsically safe option. Udfordringer fra eksplosiv gas eller brændbart støv , på en boreplatform eller i en åben mine, er nogle af de ting dine medarbejdere konfronteres med dagligt. Sikker, pålidelig kommunikation er helt afgørende i sådanne farlige miljøer. Det er her MOTOTRBO digital radio skiller sig ud . DP4401 Ex ATEX certificerede radio, leverer uovertruffen tale- og datakommunikation med integreret GPS plus uovertruffen lyd kvalitet. IP67 specifikationer for bl.a. vandtæthed. VX-230-serien, er en serie af kompakte letvægts bærbare radioer. En radio, der er kompakt og har en lav vægt. VX-450-serien, er en serie af kompakte letvægts bærbare radioer. En radio, der er kompakt og har en lav vægt. vandtæt i indtil 1 meters dybde i 30 minutter.